It’s easy for dog owners to forget that they are not the only ones in the house who need to stay in shape. Their dogs, perhaps more so than themselves, were not built for the sedentary lifestyle of modern society. It is vital that owners help their pets stay in as good a shape as themselves, and a fun way to do that is to exercise together with your dog. One important aspect to remember about the following suggestions is that you should do them with your dog on his-or-her leash. Learning exercises and going new places can be intimidating for pets, and a strap ensures that if they are spooked or distracted, that their safety always remains in your hands. Plus, staying close to pets is proven to have benefits for your health as well. Some owners mistakenly believe that walking your dog is enough to keep it in shape, but this aerobic workout fails to help build cardio, balance, or muscle in your dog that will help it to grow fit and strong. Address the cardio issue by staggering your walk with bouts of running. Run or sprint with your dog at your side for 10 seconds, then walk for 30. Repeat this process during your daily walk to give you and your dog both an aerobic and anaerobic exercise and build cardio. Many exercises owners do to build strength and balance are something that a dog can do as well. Push-ups and planking are two exercises a dog can do alongside you, but because they are strange, you will need to be patient with your dog as they get used to doing them alongside you. Push-ups will build strength in your arms and your dog’s legs. Planking is a fantastic way of improving yours and your dog’s balance. You can also teach a dog discipline and build back leg strength, which is essential for older dogs in particular, by doing sets of lunges and having your dog heel each time you lunge. 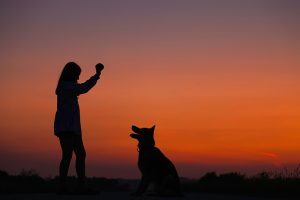 Pets love any coordinated event if they feel their owner is satisfied with their response, so praising them the first couple of times can be an instant motivator. Outdoor sports are something owners can share with their dogs. Stay fit together with your dog by going hiking together, bringing him with you while you rollerblade, or throwing the frisbee in the park so that your dog can chase it. If you partake in long-distance running, your dog can accompany you on those excursions, as a dog’s body is well-built to endure travel over many miles per day. A favorite game of dog owners can double as an excellent cardiovascular workout. Using a toy as a lure, set up two cones 10 yards apart, and then shuffle between them side-to-side, allowing your dog to chase the toy in your hands as you go. If the dog attempts to take the toy from your hand, keep your back straight and hold tight as you move to ensure you aren’t pulled. Working out together with your dog can make staying fit less of a chore and more fun for the both of you. By changing regular walks into a stagger of walk-runs, using games and sports to entertain your dog as you train, and including your dog in your strength and balance workouts, both you and your pet can help each other live a longer, happier life together.